Katy Sunrise Rotary Welcomes James Alexander! Katy Sunrise President, Hank Rennar, inducts new member James Alexander in July. 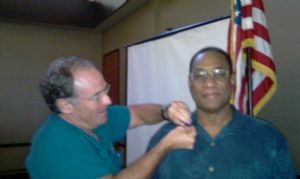 He was introduced to Rotary by Dr. Carl Estler(seen pinning him) James R. Alexander is a Certified Internet Marketing Consultant whose career of over 25 years includes helping companies deploy and utilize digital technology to increase revenue, reduce cost and reduce risk.